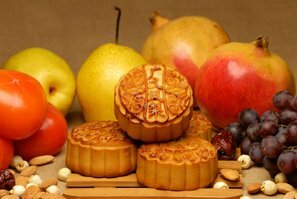 In 2019, the Mid-Autumn Festival falls in September 13 (Friday). There will be crowds at the popular tourist spots and on the transportation systems. 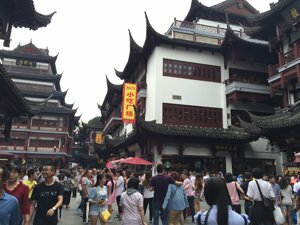 Why be stuck in crowds, long lines, and traffic jams where Chinese tour crowds go, when there is so much in China that can be visited more enjoyably? 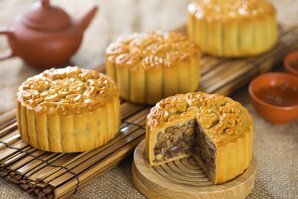 Mooncakes have become a symbol of the Mid-Autumn Festival. The dates are based on the lunar calendar, and it falls either in September or October. When the Mid-Autumn Festival holiday falls within the National Day vacation period, as it does in about one out of five years, the whole holiday period generally is a day or two longer. Dates for 2019: The official public holidays are Friday, Saturday, and Sunday. The Mid-Autumn Festival falls on September 13 in 2019. Explore West China on the Silk Road. 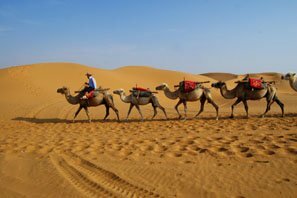 Silk Road touring: Going way out to the western province of Xinjiang means leaving touring crowds behind. Eastern places such as Xi&apos;an, Dunhuang, and Turpan will be crowded. The further west you go towards Kashgar (喀什地区, Kāshí Dìqū), the less the tourist crowding. The Central Asian people themselves usually don&apos;t celebrate the festival. There is a unique cultural blend, ancient places, and high altitude scenery around Kashgar to enjoy in quiet and relaxation. Great mountain scenery is to be seen in the western Xinjiang natural parks such as Lake Karakuli. 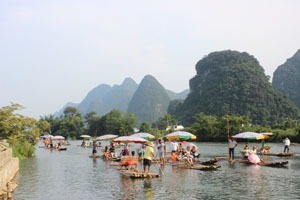 The parks in eastern Xianjiang will be crowded. It is still warm enough for biking on the Karakoram Highway near Kashgar. It could be a great high altitude scenic adventure, and the road isn&apos;t crowded. Desert scenery and ancient sites: The Taklamakan Desert is the world&apos;s second largest, and it is dotted with ancient ruins such as Mallikurwatur outside of Hetian. Shache is a Uyghur town in an oasis. Hohhot (呼和浩特, Hūhéhàotè) is the capital of Inner Mongolia, and it is an ideal starting point for touring the countryside. The Mongolians in the countryside retain some of their culture. With them, you could enjoy horseback riding, touring, and camping out in a yurt. Though there are a lot of Chinese tourists, there are comparatively less than in most tourist areas at the start of September or October. Many of the residents return home or go on vacation during the holidays, and this will help to make your trip quieter. Let us help you plan such a countryside trip. Food: Mongolian meat and diary dishes are a tourist favorite. 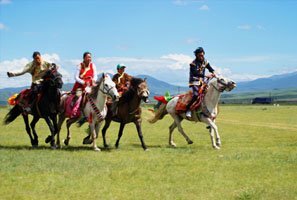 The Naadam Grassland Festival is the premier Mongolian sports event. The grassland festival usually takes place over six weeks in the summer. Sometimes it coincides with the Mid-Autumn Festival. The airport is an hour outside of Hohhot. Flying is better than taking the crowded trains. 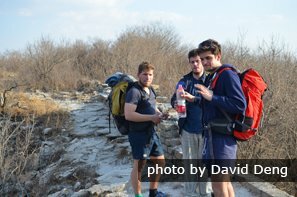 Most tourists by far go to only two sections of wall near Beijing called Badaling and Mutianyu, but Jinshanling and Huanghua Cheng are uncrowded alternatives, and if you wish for perhaps some solitude and rough hiking on unrestored sections of the wall, we recommend Jiankou or Zhuangdaokou. Jiankou has crumbling and steep wall climbs, ladders, and is covered with brush. 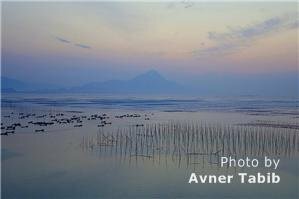 Zhuangdaokou has lake views and groups can camp there. You may not be able to gain access to all parts of these due to legal restrictions. Jinshanling and Huanghua Cheng are mostly restored, but they are tougher to walk on than the most popular sections. There are less tourist facilities available. When to go to avoid crowds? We recommend that you avoid all public transportation during the festival period. Our private drivers know how to navigate their way around better, so you&apos;ll arrive quickly and comfortably, and then they&apos;ll bring you back. This allows you the freedom to be there after other visitors take the public transportation or commercial vehicles back and enjoy a quiet afternoon and evening. Our guides can help recommend which section you&apos;d most appreciate as well. Xiapu (霞浦 /sshyaa-poo/) isn&apos;t a place to relax on sandy beaches. But many tourists like this coastal fishing town for the culture and seafood restaurants and for photography. You&apos;ll see the locals out repairing nets or collecting edibles when the tide goes out and can walk around their community, meet the people, and see how everyday Chinese live. Guide/translator: It would be a good idea to have along an experienced guide who can translate for you and who knows the kinds of places that may interest you. Xiapu is about 150 km (100 mi) north of Fuzhou in Ningde Prefecture. Wenzhou is 2.5 hours away, and Xiamen is a 5 hour drive by automobile. Public transport is difficult during the holidays, but our agency can provide a driver and/or guide as you wish. Also, this rural area doesn&apos;t have as many of the four-wheeled taxis or city buses as the cities. So it is another reason to have a private vehicle you can use. Bullet train: D-class trains from Shanghai arrive there in five and a half or six hours. 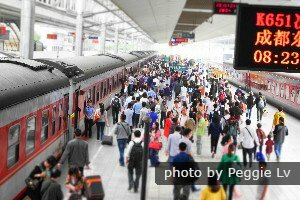 D-class trains from Wenzhou arrive in about an hour. Avoid the crowded trains if possible. We recommend air travel wherever possible, and avoid the trains and roads. In the last several years, the travel crush has gotten worse as people frantically try to get to their destinations. Book your flight tickets early, and try to arrange as much of your travel itinerary as possible beforehand to avoid upsets that spoil the fun of traveling. Large crowds in transit everywhere flood the transportation system. Transport returns more to normal after the big return to work rush about the 24th of September, 2018. For more uncrowded places we recommend at this time of year, see How to Escape the Golden Week Crowds. 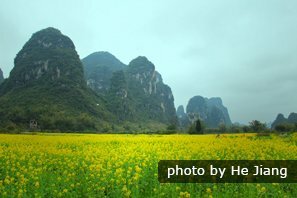 If you are planning a tour to China around the last week of September in 2018, let us help you avoid problems. Here are other things to do to avoid crowds. For the busy places: The most pleasant and interesting way to go is with a private tour company such as ours. Our travel experts could find the best accommodations and tickets during the peak travel days to save your time and money. Our tours are known for being hassle free and individualized for our customers. Visit the places you want as we create your own dream trip.